Many of us enjoy our music on the go thanks to the sheer number of devices these days that offer MP3 playback (in addition to other audio file formats, of course), and this has directly caused the peripherals market to grow by leaps and bounds – especially when you take the number of headphones or earbuds that are in the market at the moment. Unless you do not want to take the wireless route, chances are pretty good that the pair of headphones or earbuds you use will end up in a tangled mess if not properly taken care of. Somehow, cables tend to mysteriously get all tangled when you leave them alone – making me wonder whether secretly, they’re alive and plotting to take over the world when we are caught unawares. Well, Zipbuds certainly knows how irritating that can be, which is why the second generation of Zipbuds will come with premium 11mm drivers, a lighter zipper pull as well as redesigned aluminum ear buds, giving you an enhanced overall listening experience without looking like a dork. 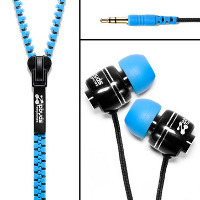 It doesn’t matter if you just want to look good while wearing a pair of zipbuds, or if you’re a true blue music lover or game a whole lot – the G2 Zipbuds will still be able to deliver without missing a beat (pun not intended). Sporting 11mm drivers that are larger than the 8mm drivers on the first generation, the discerning pair of ears ought to be able to enjoy a more balanced, crisper noise projection alongside sound quality that rivals the highest-end brands on the market. It is also 20% lighter than its predecessor, paving the way for a more comfortable experience with less pull on the ear buds. Not only that, redesigned aluminum ear bud casings on the G2 Zipbuds are also more form-fitting, where it will remain in the user’s ears no matter how active you are. I absolutely love the “vertebrae” zipper design that features feather-light flexibility. You will be able to choose from a bevy of color combinations such as black & black, pink & black, blue & black, pink & white, and blue & white, where each $39.99 purchase comes with sweat resistant Sport Ear Clips.